Win her love all over again with this delightful array of pink roses, pink lilies and other favorites in a dazzling clear glass vase. Imagine her excitement when this appears at the door. 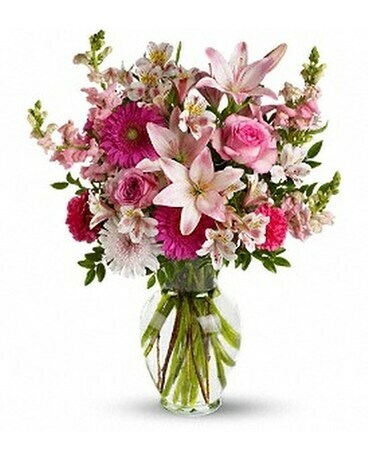 The cheerful bouquet includes pink roses, pink asiatic lilies, hot pink gerberas, light pink alstroemeria, hot pink carnations, pink snapdragons and lavender chrysanthemums accented with fresh greenery.Delivered in a classic urn glass vase. Approximately 19 3/4" W x 24" H Orientation: All-Around As Shown : T526-1A.